Never worry about high international data charges again with the Big Sky Travel Sim. With just three easy steps, you can now stay connected no matter where you are in the world. Buy the sim, download the app, then purchase your desired data package. That’s it and you can now enjoy the availability of internet connection in areas covered by Big Sky. Fast, convenient, and affordable, this reduces the need to buy a local sim in every country you go to. 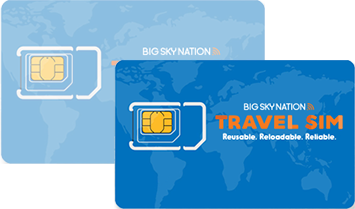 Available in over 80 countries, the Big Sky Nation Travel Sim will be your ticket to the world. Find out how to get one here! 4G Reusable, reloadable, reliable, data Only Travel SIM available in over 80 countries. Super Affordable: Enjoy data packages for as low as USD 1.3 per day. Solis will forever change the way you travel. Embark with a new perspective on your pursuit for adventure with this high speed and multi-functional travel hotspot device! Smart and simple to use, failing to staying connected will be a non-issue no matter where you are in the world. Not only is it reliable with its LTE internet connection, but it also doubles as a power bank so you wouldn’t have to worry about losing touch with the updates from all over the world. Travel with Big Sky and Skyroam Solis, you will not regret it.